This innovative litter scoop is a great solution for elderly cat guardians or those with bad backs and sore knees. The Stand-N-Scoop is an all steel scoop with a 54 inch handle. 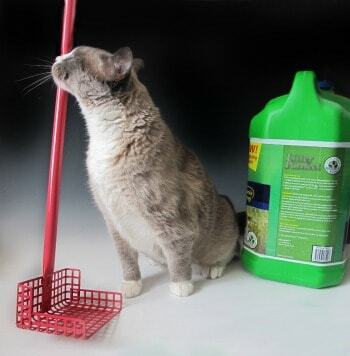 Weighing only 2.7 pounds , the 4×6 inch scoop catches the smallest particles and works well with all litter types. It comes in 3 colors: hot pink, blue, and gray. The scoop is powder coated for a sanitary surface. Made in the USA, the Stand-N-Scoop comes with a Lifetime Warranty. Enter to win a Stand-N-Scoop Litter Scoop – 3 Winners! To enter this giveaway, please leave a comment letting me know why you’d like to win a Stand-N-Scoop. For an additional chance to win, share this giveaway on Facebook, Twitter, Google+ or Pinterest, and leave a separate comment for each social network, letting me know that you shared. No need to post the link to your share. This giveaway is open to readers everywhere. This giveaway ends Thursday, May 29. Winners will be chosen by random drawing*. For more information about Stand-N-Scoop, and to purchase, please visit their website. *No purchase necessary. Void where prohibited. Winners will be notified via e-mail. Prize winner must provide The Conscious Cat with a physical address to which the prize will be mailed within 72 hours. If this information is not received, an alternate winner will be chosen by random drawing. Winners will be announced in a separate post following the drawing. FTC Disclosure: This post is sponsored Stand-N-Scoop, which means that I was paid to feature this content. Regardless of payment received, you will never see products or services featured on this site that I don’t either use or would use myself. It would be a life saver to win the stand_n_scoop because being a senior with a painful large cyst on my right knee and fibromyalgia. 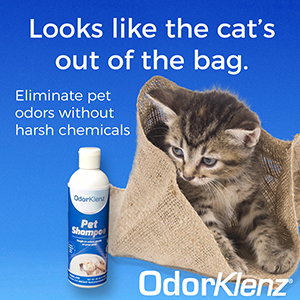 Added to this the osteo-arthritus makes it really painful to clean my 10 lg cats 5 lg litters , 4 times a day. It hasn’t been something found available locally and a fixed income makes it hard to afford. I have 5 cat boxes and bending over at least once a day to clean each box is getting very hard. This scoop is awesome. I would love to win this so I do not have to bend over to scoop the litter anymore. Thanks! I need it because I have 3 cats and back trouble. I would love this to not be do close to the smelly litter box and it would make it so much easier to scoop without bending down. I have shared this on Twitter. Forgot to sign my name in my main comment. Mary Beth, Tom, and our fur kids. Ever since I was hit by a car in 2005 I have had more and more trouble with my knee that was injured along with the issues I already had with my back and neck. It makes cleaning the cats boxes really painful at times and boy has it been awful at times too just to get back up from cleaning. This would be so absolutely wonderful to have so I would not have to spend so much time getting to the boxes and then getting back up. Fantastic invention for sure. My husband and I are past our 8Oth birthdays, and this would be a huge advantage to us who have trouble bending over. I shared this giveaway on my Catnip Bazaar Facebook page. I would love to try this litter scoop for my 4 cats. And if it works well I would like to try to promote it, if I can contact the manufacturer, on my website. I shared this giveaway on Google. This scoop would be great for me, so that I wouldn’t have to bend to scoop Roca’s litter box. I was just thinking the other day…” How am I going to build something to put the litter boxes on to raise them …this is killing my back.” As I get older it’s harder to bend and scoop. This is the answer…so simple. Thank you for sharing. I shared on two Facebook pages. My page and Anya the Snowshoe Cat’s page. My reason for wanting one of these wonderful scoops is that I’m having some significant knee problems. My work throughout July and August will require me to stand in place for anywhere from 3 to 6 hours each day, for seven weeks. As I’m the family member who takes care of the litter boxes for Anya and Oscar, I would love to try this scoop. Wow, this would be purfect for me! After 2 unsuccessful back surgeries it would help ease the pain a bit. I pinned on the cats board on Pinterest. I would love to win this as my husband sometimes helps me clean the litter box. He has a bad back and this device would literally be a back saver for him. Shared original facebook post on facebook. Scooping litter has become quite difficult for me … I have ostoearthritis of the lumbar spine with sciatic nerve involvement which has gotten worse over the years and a torn medial and lateral meniscus which makes even a slight bend of the knee quite painful. This could be a tremendous help. I would love to have one! I have herniated disc and degenerative disease in my neck and spine. I currently have 13 indoor cats that I care for. I think this would be a huge help in my daily cleaning. Thank you I love your e-mails they are very informative. I shared this on Google. I need this since I am 70 years old, have 11 cats, and 12 litter boxes. I have wicked lower back troubles,this scooper would be great,I wouldn’t have to bend over and/or get down on my hands and knees as much. Thanks. I am trying to think if I have any part left that does not ache.